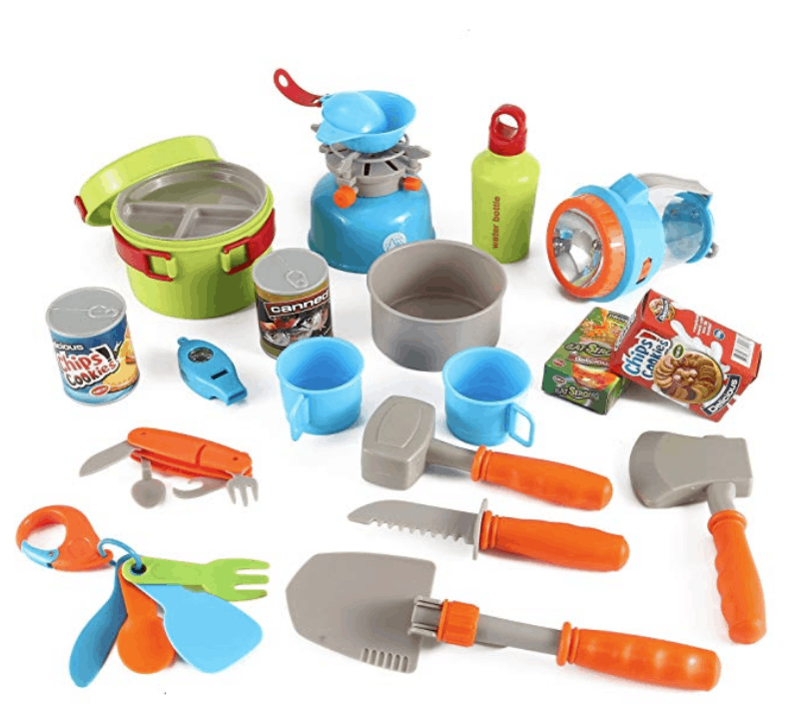 If you love camping, then it sort of permeates your life – you get camping shirts, camping mugs, camping decor… and of course, if you have kids, fun toy camping sets and toys! I’m not gonna lie, I’m a sucker for camper themed stuff. I’m totally the person that falls for all those cute camping shirts, and the amazing mugs (my husband has one that says “camping is IN-TENTS” LOL!). So, it’s not surprising really that I’ve gone down the rabbit hole of kids camping toys. And OH MY GOSH! I want to get some just to display in my own bedroom! So much fun camping play – from camping themed games, play sets, glowing campfires, heck.. even Barbie seems to enjoy getting out! Best of Kids Camping Toys, Books and Activities! Barbie Camping Fun Camping Sets! 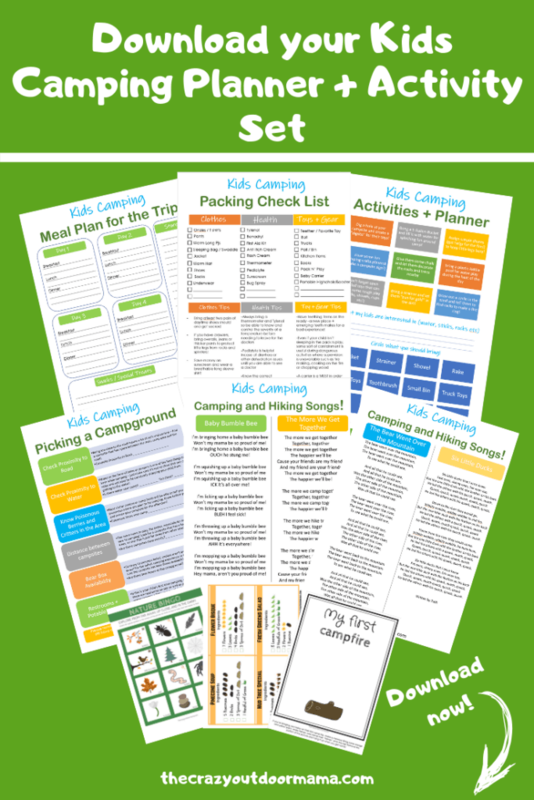 If you’re camping with kids, don’t forget to get your 9 page planner! It makes your trip so much less stressful! LEGO RV Camper with Pull Behind Boat! “Mia’s Campervan” LEGO RV with tent and camp toys! LEGO Truck with Pull Behind Camper! For the Van Life People… a LEGO Camper Van! Best Camper Trailer Toy for Babies and Toddlers! “Happy Camper” Plush Campfire Play Set for Kids! Camping Games, Toys and Books for Kids! Little Explorers 20 Piece Camping Toys For Kids! 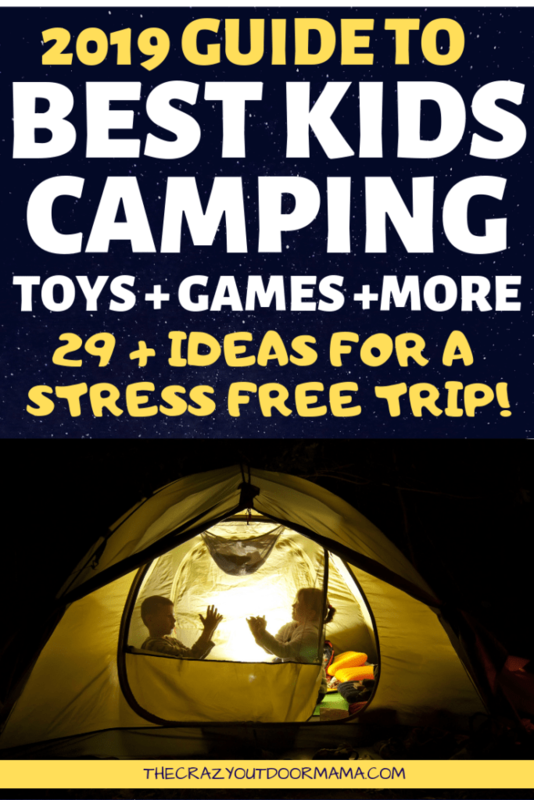 Play your own camping games with this fun list of over 20 ideas! More Camping Stuff for Kids! Kids Walkie Talkies for Around Camp! Barbie Camping Fun and Barbie Camp Sets! Barbie Made to Move Posable Rock Climber Doll! It can seem pretty intimidating to have to pack up everything you need to take care of the kids while you’re out – but it’s alot easier if you stay organized! 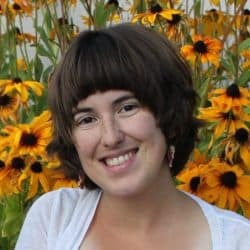 That’s exactly why I made this planner – after many trips forgetting things, or not thinking of something ahead of time, I wanted to have a planner for each of our trips so that I wouldn’t worry so much! I’ll try and divide it up even further so that it’s easier for you to find what you need! These are FREAKING adorable and perfect for the little camper who loves legos! You can build an opening camper with awning, picnic table, boat, grill and even a bear! It includes a woman and child figure, and guess what.. This can be rebuilt into a Summer Home AND a Yacht! I love multifunctional toys! This is best for older kids around 9 to 14. This sweet RV + Boat LEGO set can also be built into a summer home or Yacht! This is probably my favorite one! It has a fully functioning RV (bathroom kichen, canopy, upstairs sleeping area), a tent, picnic table, apple tree, camp signs, two girl campers, a boat and a horse! This is THE camping set to get! The ULTIMATE LEGO camping toy for kids! Tent, boat, camping signs, apple tree, horse and more are all included!! This set has a removable roof (to play inside the camper! ), an opening side and support leg. It includes a mom, dad, child and.. a crab? LOL! This LEGO pull behind camper is so real looking and you can take off the top for organizing the inside of the camper! I couldn’t leave out the camper van when dong a camping post – they are sort of all the rage now! This is another multi use LEGO set, and it can be converted into a quad bike + lifeguard tower or a beach buggy! This sweet camper van is beach themed, but there’s a grill and chairs… so it will work for camping too! These campers all have a classic touch to them, which means they are really well made, or perhaps made out of wood! I love this set because it is SO well made, and they have really paid attention to detail! This set includes two adults, two kids, as well as tons of camping accessories such as a mtrres, table, chairs, dishes, food and more! The figures can even sit, and of course the roof comes off so that kids can play inside the camper too! This PLAYMOBIL summer camper toy comes with all the camping goods and the top pops off so that kids can play inside of it too! And if you want even MORE camping stuff.. check out their MEGA camping set! This things has raccoons, bins, bikes, sleeping areas, a canoe and MORE! Simple, wood toys are BIG right now – and for good reason! Simple toys really inspire imaginative play, and durable toys like these are perfect for little hands! This camper also has little magnetic spots to keep the charcters (2 adults, two kids.. and two flamingos for fun!) in place! I love how this looks, as well as the timeless, classic feel of the wood! This beautiful wood toy camper with 4 people is perfect for the Montessori parent and child… simple toys are conductive to imaginative play! I included this one because it does look really functional and awesome, and I’ve heard alot about Shopkins! My kids aren’t of the age for it yet, but I know they will be soon and wanted to remember this one! This Shopkins Camper Van opens up to reveal a whole living area inside, and includes Lil Shoppie Pinkie Cola! This is CUTE! Everything stores inside of it, it has tons of songs and phrases about camping, and even a glowing campfire! I really wish Amazon had chosen a better picture for this awesome baby camping toy camper to show all that it has! Inside are chairs, campfire, bath and more! It unfolds and opens into a complete camp scene! No camp out is complete without a campfire! 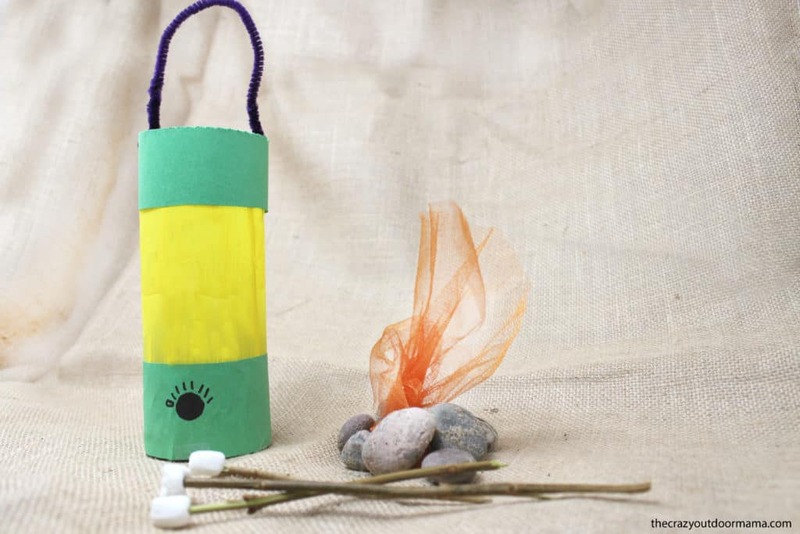 Check out these super cute campfire toys to really bring the magic into your inside camp out! P.S. 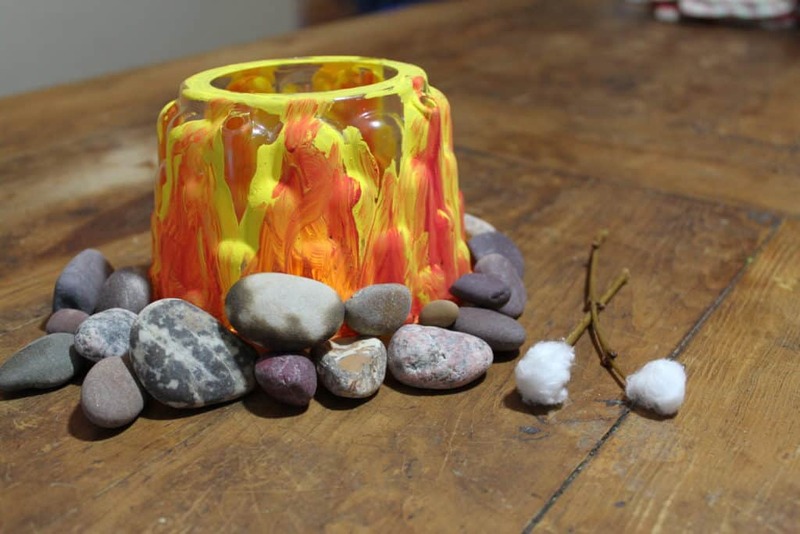 Make your own glowing DIY campfire for super cheap here! This adorable kids campfire camping playset includes the essentials – the campfire, a hotdog roaster, smores, and a lantern! Best of all, it all stores in a duffle bag so that it’s easy to keep track of as well as bring to a friends house for an indoor camping party! This camping pretend campfire play set from Learning Resources New Sprouts is cute and packs away so easy! You have PROBABLY seen this adorable campfire plush somewhere, and it’s no wonder why… it’s really cute! I love that this campfire toy is made of soft materials so that even younger kids can enjoy it – I know that my three that are three and under are in the smack eachother with stuff age, so this would actually be a safe toy! This adorable felt / plush campfire play set is perfect for babies and toddlers for gentle play, and it will complete your adventure themed play room! This is a really awesome set of campfire essentials! It includes an actual LIGHT UP FIRE (don’t worry, it’s cool to the touch! ), bacon and egg fry set, a lantern, and of course roasting sticks for hot dogs and marshmallows! This campfire toy is kind of the deluxe of the one I first listed, and I really love that it has such detail! This Campfire Kids Camping Set includes everything you need to have an awesome campfire… including s’mores, hot dogs, and even a light up campfire! Now, I only have kids that are super young (3 and under) but I know we tend to find alot to do just playing outside. Before you spend any money (especially for younger kids!) check out this post on 11 fun and easy activities to do around the campground! You might end up not needing as much as you thought! However, if you’re looking for some fun camping games to break up long camp trips, or maybe for a rainy day inside, or perhaps just for your indoor camp party… you’re at the right spot! It’s always good to prepare for anything new by reading and talking about it first! I have written an article on the best camping books for kids – it has over 13 fun, picture filled camping themed books the little ones will love! I love this scavenger hunt because it includes alot of cards that aren’t meant for a particular item, but for a item that meets the description on the card such as “small” “furry” or “skinny”! Each card has a picture with it making it a fun game even for kids as young as three who can’t read yet! It’s great for sensory play, and really teaching kids to observe what’s around them! 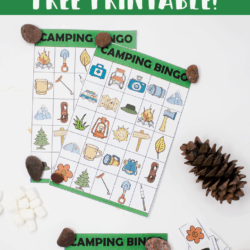 This nature scavenger hunt game has raving reviews, and is an absolute awesome camping game to encourage kids to explore nature and notice the little things! While you could bring your own pots and pans (which I do, but only because at the time I didn’t know they had handy sets like these!) you could definitely bring this cute set instead! It has fujn things like a stove, some pots, cups, digging tools, food lantern + alot more and it all stores in an easy mesh bag which is so important when traveling! I love this because it makes just a perfect outdoor toy set – I see lots of backyard camping play going on with this gem! This camping toy set has enough stuff in it to entertain multiple kids for hours! Kids will especially love having their very own lantern and tools, and having lots of cups and things to fill with dirt and rocks! This goal of this fun card game is to be the first player to start your campfire and toast three marshmallows – what makes it fun is that opponents can mess with your campfire and try to mess you up! It comes in a nice, waterproof resealable package (perfect for bringing on camp trips for raindy days!) and people said the kids as young as four were enjoying it! This glow in the dark game has everything you need, and you can get started in minutes! This glow in the dark capture the flag will have the whole family laughing and running around like crazy people! Anything that glows is so fun – bring the magic to your campout! Let’s not forget that you don’t HAVE to have toys! 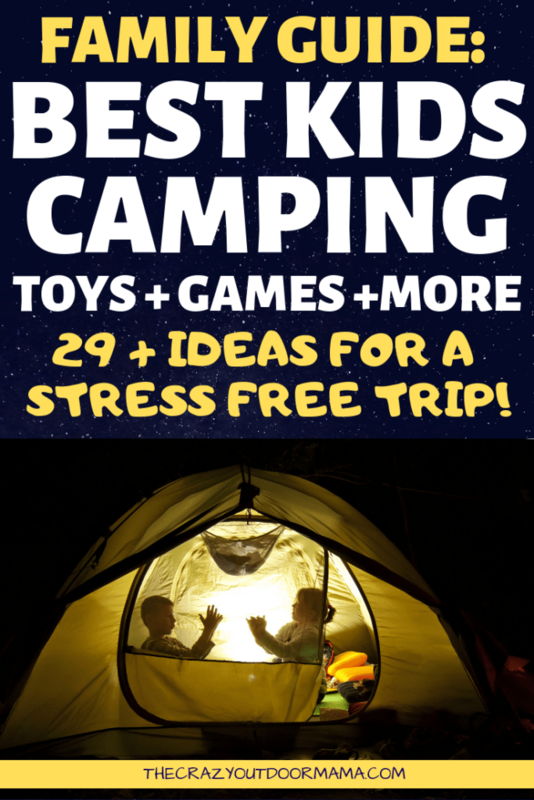 This is an awesome list of camping games for kids that require next to nothing to play! I highly encourage you check it out! This list isn’t neccessarily toys, but it’s stuff kids will LOVE to play with anyways, such as play tents, walkie talkies, binoculars and more! Kids really love having their own versions of camping items so that they can have some AWESOME play time! I’ve compiled the top rated items from each category! This play tent is perfect for indoor our light outdoor use, and can fit multiple three year olds in pretty comfortably! It is really easy to set up, stores just as easy, and has a play tunnel port it can connect to for even more fun! This play camping tent is cute, easy to set up and take down, and has a tunnel port in the back for more added fun! These binoculars are perfect for little hands! They are the only binoculars designed for kids – focus free, giant comfy eye pieces and easy fit goggles. They are also way more rugged than normal binoculars, and have a break away neck strap! There’s been a couple other educational insights brand items on the list – they are consistantly high rated, and seem to know their stuff! These are the ONLY binoculars designed just for kids – they are focus free, have comfy eye pieces and a break away strap! These won the Parent’s Choice Award! Nice, functional lanterns designed for a little abuse are perfect for camping trips! Besides being just fun, this lantern is a great toy to take camping fora toddler who might be camping for the first time feel a little safer in the dark! Related: DIY your own glowing camping lantern with just a plastic bottle, some paper and paint! Your kids will love it! This also doubles as a fun starry night light for the tent, camper, or bedroom for your next camp out! This awesome kids camping lantern doubles as a starlit night nightlight! It projects the nightsky into your tent, camper, or even your child’s bedroom! Walkie talkies are just pure magic for kids – I remember have a set I always used with my brother when we would go out exploring! This walkie talkie has a nice shape for little hands, and is easier to use too! These cute kids walkie talkies are fun for around camp and out hiking! They are perfectly sized for little hands and easy to use! I was really impressed at the amount of awesome camping and outdoor themed stuff that barbie has! I grew up with barbies, but don’t remember ever seeing ones that did stuff outdoors… anyways, I hope you’ll enjoy the “cream of the crop” with these awesome barbie camping items! Oh man I wish real pop ups were like this! Haha! This barbie camper turns into a three story fancy party place complete with all the neccessities (bathroom, kitchen etc) as well as bonuses like a fire pit and swimming pool! This Barbie camper van transforms into a 3 story camping party house complete with a campfire in the back and pool up front! This Barbie Dream camper is legit! With just the push of a button, the sides pop out and the back extends to create over 2 feet of barbie camp play! 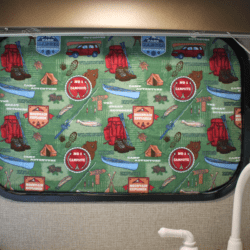 This camper of course includes all the camper norms such as bathroom amenities, a kitchen area and chairs! This awesome Barbie Dream Camper is massive, and has everything a camper could need, and bonuses such as a pool! Chelsea comes with a tent, campfire, marshmallow sticks, frying pan and more! Have a fun campfire night with Chelsea – she even has matching pillows and blanket! This cute Barbie Chelsea Camp set toy comes with everything she needs for an awesome tent camping trip, including a campfire and smores! This set seems to include the basics of what you need for your full size camping barbie – a Skipper Doll, tent, campfire and some chairs! One person mentioned that the tent this barbie comes with can actually fit four barbies! Yay for friends! This Barbie Camping Fun Tent comes with the camping basics (including a campfire!) and also a tent that can fit 4 barbies! This seems to be the “starter” camping barbie, and has alot of additional accessories you can purchase for her! P.S. there is another camping fun barbie starter set I found, but this one is the Camping Fun Stacie Doll with a Horse! Fun! This is the camping fun base barbie, and she has lots of fun accessories you can buy for use with her! These are simple little add on sets so that you can perfect exactly what kind of camping activities to do with your camping barbie! I picked some of the cutest ones! This camping accessory set includes a sleeping bag, pillow and flashlight! This camping fun accessory pack includes a campfire, two s’more sticks, a a stool and guitar! I wanted these dolls to have their own mini section because they are awesome! These are dolls that show what women can really do such as climb massive mountains and hike for miles! I adore these and they will definitely be on the birthday list for my little camping twin girls when they are old enough! This doll is ready to conquer! She has over 22 joints meaning she is just as movable and flexible as real rock climbers! Not to mention she comes with awesome accessories like a backpack, hiking stick, trail map, harness, carabiner hooks and rope! This made to move rock climber barbie has 22 “joints” and TONS of rock climbing gear! I love it! Top pick! See it on Amazon now! This hiking and climbing doll is another variatoin of the one above – I just wanted to include her because she is awesome too! She also has all the rock climbing gear, and is amazingly fashionable while doing it! This Barbie Camping Fun Hiker Doll is an awesome toy to get for the active child in your life! She hikes, she climbs… she is an outdoor pro! Camping with kids can be SO much fun – if you’re prepared and have the right expectations! It’s true that just the act of camping will likely be enough to entertain your kids. However, it’s always good to bring a back up plan (like some awesome toys!) just in case things get rough! Besides, even if you don’t need them for your actual camp trip, these toys are just fun to play with for pretend play and back yard camping! 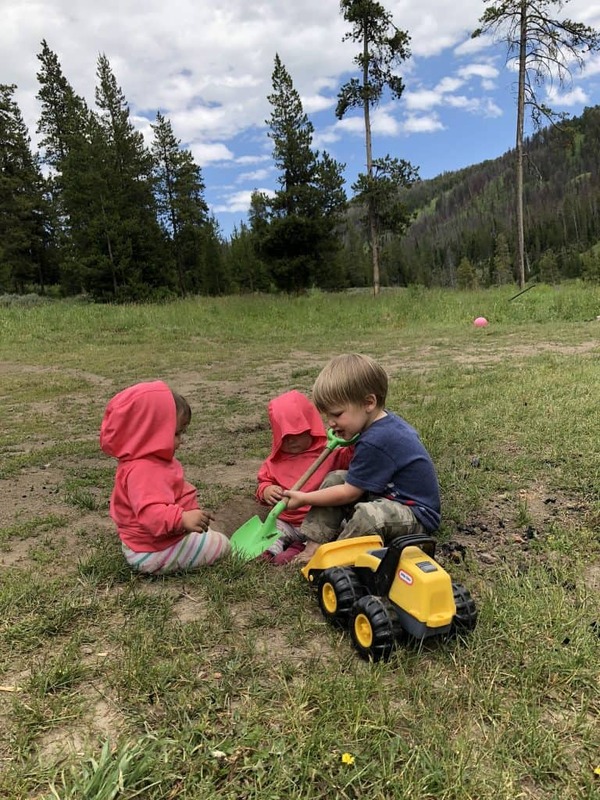 Before you go, you have to check out this toddler family camping guide – it is literally EVERYTHING you need to do from planning the trip to packing up camp! If you are a parent of littles, I’m sure you’ll love it!